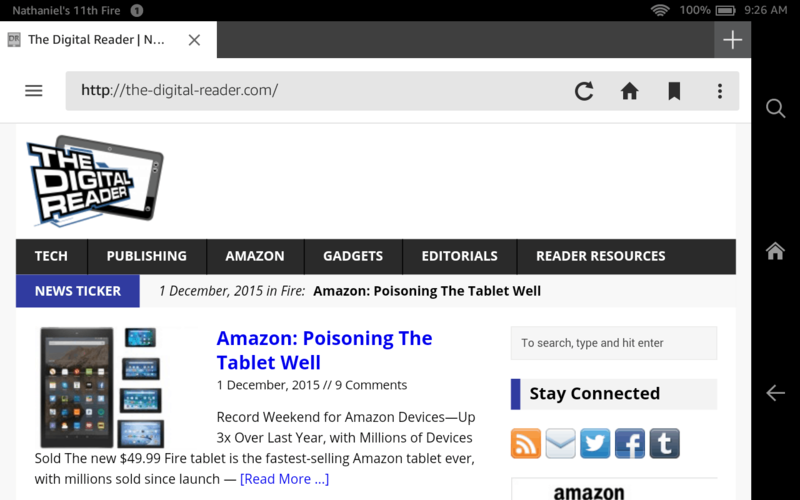 Amazon officially announced a new update to its Silk web browser yesterday, which is good news for Fire tablet owners. The latest update follows a beta release in September that made a lot of changes and pissed off a lot of users, and yesterday Amazon responded to the complaints by fixing the bugs and restoring a couple features. We changed the color theme for better readability. The navigation bar includes icons for the home page and bookmarks for easy access. We also made the entry point to Silk’s left panel menu easier to access, increasing the size of the hamburger menu icon. From the left panel menu, you can enter Private Browsing, view your history, and customize your browser settings. The app looks fundamentally the same as it did after the September update. It still has the same white and light blue-grey color theme, but Amazon also made a number of changes that aren't immediately visible but will please long time users. According to Amazon, they've improved the home screen with a better layout, and added a bookmark page and a reading list page to the home screen. Users complained about an uptick in crashes and sluggishness, and according to Amazon's blog post they "made a number of improvements to performance and stability". Amazon also restored the button for the the distraction-free "article view" reading mode; that button is visible again in the navbar next to the refresh button. And finally, Amazon did not restore the full-screen option (not unless it is hidden somewhere). So what do you think of the app? Did you find a feature I missed? I can't really say that I've noticed the differences; I don't use Silk very much. But I did prefer the older and darker color theme; I thought it was more readable. Can Anyone Recommend an Alternative to Hootsuite?